Logging hours during the winter is key to starting your spring riding season off on the right foot, but we forgive you if you don't want to deal with slushy roads and less than favorable weather. If you'd prefer to log those base miles indoors, the CycleOps Mag Trainer lets you do just that. To tailor your training, you get five different resistance settings, which span the gap between an easy spin, and high-resistance hill climb simulator. When spring rolls around, your friends won't know what hit 'em. The classic series Mag frame supports the magnetic flywheel from which the Mag derives its name. It provides linear resistance, or in other words, unlike a fluid trainer, the resistance doesn't increase as your wheel travels faster. As you'd expect with a quality mag trainer, it gives you the option of five levels of resistance. That means that you can go between low-impact base miles and high intensity training without an issue. 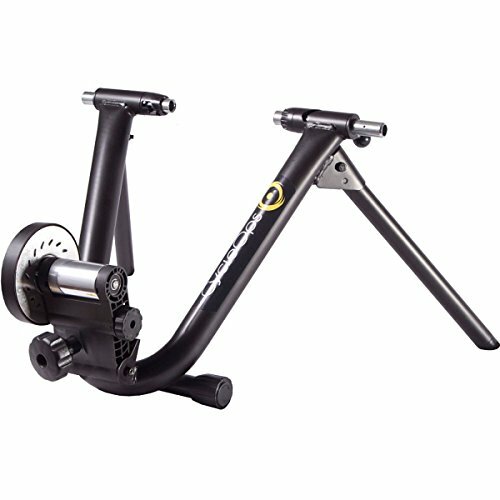 The CycleOps Mag Trainer is available in one size, and in one color.